A reasonably simple solution, SwitchResX is a third-party preference panel that allows you to run custom resolutions on any display. Install the preference panel, select the Retina Display, and add a custom resolution setting for 2880×1800. This shareware app is free to use for 10 days before it wants to be registered. SwitchResX has a lot of technical customizations available within it, possibly making it overkill for this task. Probably the easiest option of them all, SetResX is a little menu-bar app that allows you to run 2880×1800 easily. Hopefully the developer of SetResX will find a less shady site to host their app, but nonetheless SetResX does work. The command will report back the resolution change, the 16 at the end is color depth so you can set that to something else if you’d like. You can set it back to the default resolution either through System Preferences or with scrutil s 1440 900. Pick whichever method best suits your needs, though with the Retina MacBook Pro just now starting to ship to many customers there’s a high likelihood that better options will soon be available. We’ll keep you posted. Redesigned MacBook Pro Lineup to be Revealed This Year? I am surprised Apple didn’t give the option in Display Settings. Why top out at 1920×1200 if higher is a possibility? I guess it was in an attempt to try to force people to develop for hidpi. The more users, the more demand on apps. Personally, having my screen at 2880 means i can sell my monitor and just do all my work on my laptop, and i don’t have to wait for photoshop and aftereffects to update to ‘retina’, so on the other hand i can defiantly see why people are angry about the restriction. Well, it probably has something to do with the fact that they stepped down from the mid-grade GTX 560M Nvidia chip to the top end entry-level GTX 650M in the latest refresh (which benches show performs about as well as the 560), but they didn’t want to overtax the GPU pushing full resolution out of a lower end chip. Users would have probably been better served with a 1920X1080 display, having the price difference of the display applied to a 660M or even a 670M instead. Well, for what it’s worth, the resolution limit isn’t the issue. When you run 1920×1200 mode, what’s actually happening is that the GPU is pushing out 3840×2400 and then scaling it en masse to the 2880×1800 display. Applications act like they’re rendering to the 3840×2400 canvas at HiDPI. The result is what looks like a 1920×1200 size but with much higher detail. So if Apple has no qualms rendering to a larger backing and then scaling, why would they worry about rendering to a native 2880×1800 backing? It would actually improve, not decrease performance. Apple simply disabled the option because it’s small and hard to see. Is it the right choice? Maybe not, having the option wouldn’t hurt. But that’s their decision. It actually is ok for 12pt text for me right now, but ill get back to you in 3 eyes when my eyes don’t work any more. Would you mind not linking directly to Sendspace and instead to Reddit? I’m sure I will be updating it in the coming weeks, and as such, don’t want people using out-of-date links. Also, blame the shady hosting on me being too cheap to host a utility in testing on my own website. MacWorld ripped off your post and didn’t give you credit. I went for the SwitchResX which works nicely. I have to say that once you’ve tried the 2880×1800 native resolution you won’t go back, we not unless you’ve got bad eyesight. I love lots of real-estate, I can work on one side, have a broswer on the other, a spreadsheet in another and still watch a 720p movie in full res, absoluteoy perfect! As others have said, I really don’t know why Apple have only gone up to 1920×1200, I can’t see any reason for anything other than native res. When an app is HiDPI enabled, the content is effectively (or is capable of using) that full screen resolution anyway, albeit with larger interface elements. For example opening a high resolution photo in Preview full screen in the optimal (looks like 1440 x 900) resolution setting you’re still seeing the full 2880 x 1800 pixels and the same amount of detail as running the display in its native resolution. The same works for video and text. All running at the full resolution achieves is turning off any kind of interface and pixel doubling, so if you zoom to a 1024 x 1024 pixel image’s maximum size in the optimal setting, you’re actually seeing the image at 200 %, whereas at the screen’s native res you’d see it at 100 % but half the size. This is the best app I’ve found to easily switch between native resolution and retina res. The best app is still QuickRes. They added support for keyboard shortcuts, notifications and still are the quickest way to switch between resolutions. There is also a new app named ResolutionTab http://resolutiontab.com, it changes display mode in one click. does it but doesn’t look right, kind a like 1440 on a non retina macbook. quickres looks good but it doesn’t work with Lion! I spy a Dr. Octagon album in that screenshot. F yeah! For a retina-display Macbook Pro, SetResX does not revert to ‘best-for-retina’. Text and images look fuzzy. Not recommended. QuickRes works fine, but has some nasty keyboard-shortcuts that conflict with my workflow (Capture One). SwitchResX is great and definitely worth the €14,- after the full trial period of 10 days. I love it when I start up Capture One or Photoshop and the screen resolution automatically changes to 2880×1800. Quit the program and the screen goes back to ‘best-for-retina’. Will any of this work for Ipad retina? To see additional resolutions in the Display preferences, hold the Option key and click the “Scaled” radio button. Not working on Mavericks any longer it would seem. This isn’t exactly a Wineskin related post, but… with the new Retina Macs not having a way to truly change the resolution, I threw together a little app that uses the WSReso command line tool I made for older versions of Wineskin for changing resolutions before RandR was added to XQuartz… it uses WSReso and its just an Applescript GUI front end that lets you change resolutions, including knocking that Retina Display Macbook Pro up to a true 2880×1800. 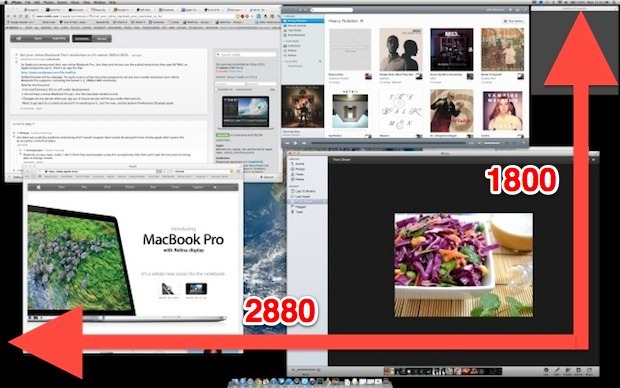 Works on any Macs for changing resolutions around… its very simple, but effective. Thank you very much for the info. For Flip-Q Pro Teleprompter It was required to have both monitors at the same resolution and SetResX did the job. If you already use brew. otherwise i would recommend cakebrew. very nice gui. there install screenresolution. then in applescript automator add applescript with the following. adapt to your needs.